Told through the wonderful and illuminating world of infographics, Visualizing The Beatles takes you on a magical history tour through the career of the Fab Four. Telling the story of the band through stunning visualizations and bespoke illustrations, authors John Pring and Rob Thomas explore the legacy of the band by looking at their incredible discography, from Please Please Me to Let It Be. Visualizing The Beatles is available now in North America on Dey Street Books. Copies are also available via publishers in Spain, Germany and the United Kingdom. You can buy a copy of this phenomenal book now via Harper Collins, Amazon, Barnes and Noble, Indie Bound, Walmart and all good book stores. 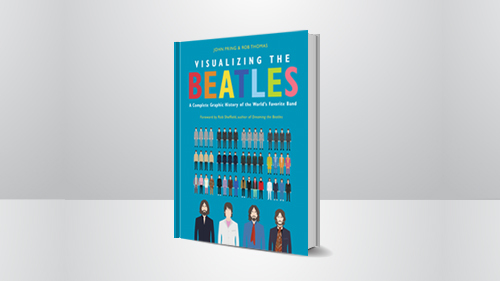 Visualizing The Beatles is released out now on Dey Street Books, an imprint of Harper Collins. Visualizing The Beatles is written by lifelong friends John Pring and Rob Thomas. Learn more about them.